Dr. Sabina Brennan has good news about staving off dementia and adding an extra two healthy years to later lives. 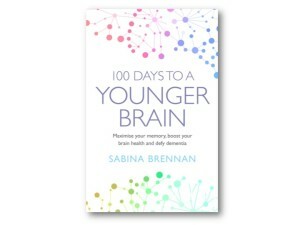 ‘100 Days To A Younger Brain’ Maximise your memory, boost your brain health and defy dementia’ is her new book about brain health. It is an activity based programme that analyses peoples individual progress, empowering them literally, to rejuvenate brain power. “There’s a lot of fear out there about getting dementia and people think that there is nothing that can do, but when I give them information about the risk factors and how they can boost their brain health, how you are never too old to make those changes, it is fantastic to see people get hope back in their lives again.” There are risk factors for dementia that are modifiable things that you can take action on to reduce your risk of developing dementia, she says. 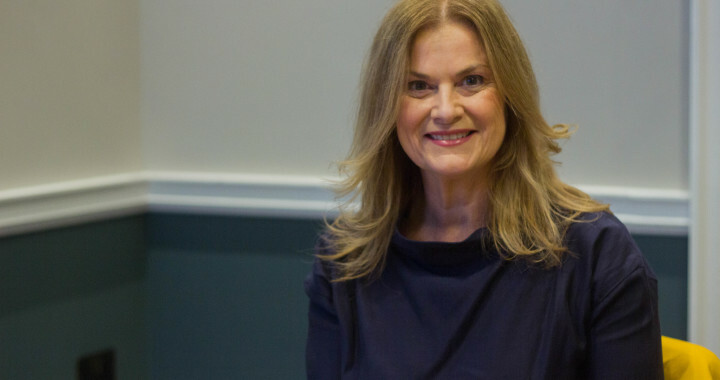 Sabina Brennan is a leader in communicating information about brain health and empowering people of all ages particularly through her writings, animations and TV and radio appearances. Empowerment through entertainment is her philosophy, particularly about the animations she has worked on to get complex medical education ideas across in a simple format to a general audience. ‘I consult people throughout the process’ she says about the animations which were funded by the EU Commission, so that she can tweak the story and to avoid telling people things they already know. Dementia and cognitive decline is not a ‘normal’ part of ageing she says, and this is a key message Sabina Brennan tries to get across. “There are a lot of things that mimic dementia in later life but the things that boost brain health are things that you might not expect. Getting physically active is important.” As well as aerobic exercise like going for a brisk walk, Brennan says anaerobic exercise, muscle and strength building like lifting weights, is just as important as we age. “We think we loose muscle mass because we age. We actually loose it because we stop doing things, we stop moving. The reason why you need muscle mass and balance is because you can start to fall and that can start a chain of events that restricts mobility. Another thing Brennan recommends is staying socially connected. Dr. Sabina Brennan says that there is a direct relationship between the density of your social networks and the density of your neural networks. “This thing of socialising only with our peers has to stop. We need much more intergenerational engagement. Next time you are at an event like a wedding, make an effort to talk to someone who is either twenty years younger or twenty years older than you. You will get a nice surprise usually.” Loneliness is a signal, it is like our hunger signal, Brennan says. It’s painful and is telling us to take action to do something that your body needs. It is not necessarily age dependant you can be lonely as a new mother, starting college. It is context dependant. Age related hearing loss can lead to lessening social engagements so she recommends getting your hearing tested if you think your hearing is diminishing. Filtering out background noise can can get more difficult as you age. “We have no problem getting glasses when their eyesight declines but nobody wants to get hearing aids but I say the sooner you go the better”. There are wonderful technical developments now with hearing aids. Life long learning is also important she believes. You can hold onto your brain functions for longer by challenging yourself. With learning comes the new neurons. Feel the Fear and do it anyway, as the book of the same name says. Question Everything especially yourself. Focus on what you want to achieve and write them down to fine tune it. Innovate. Innovation is trying to find simple solutions to complex problems. Because we are so clever we sometimes look at complex solutions instead of the simplest solution. Everything you can do to reduce your risk of dementia is free and within your own power to do when it comes to brain health. Acknowledge multiple starting points. There are always steps towards a goal. Big changes come when everybody does little things. Give people goals and the freedom to use their own imagination because with that comes ownership. Measure twice cut once. It is about making sure you have it right before you go out there. Listen to the podcast now, get out for that walk later and go talk to someone twenty years older or younger than you. It could be the best brain exercise you could do for yourself today and for someone else.